I do like flapjacks, they feel healthier than biscuits thanks to all those “good for you” “bursting with energy” oats and that means there’s no mammyguilt about putting them in lunchboxes. I’ve tried loads of different recipes and a lot are hit and miss, too crumbly, too crunchy, too sweet, too “fall aparty” but these from Rachel Allen’s Food for Living are the best and most consistent I have ever made. It’s funny, I did question the inclusion of flour but I think it’s the magic ingredient in these. They are lunchbox favourites in our house and the batch we made last Tuesday are still good (and gone this morning) so they will keep for about 5 days in an airtight container that is out of reach and sight of the kids. For younger kids I’d cut them small as they are sweet and heavy. Preheat the oven to 180C. Root out your swiss roll tin, it’s probably under lots of other tins and you will knock at least three with lots of noise trying to find it. You may utter swearwords. While you’re at it, find the wire cooling tray as you’ll need that later. Then find the greaseproof paper and line the tin with it. In a large saucepan gently and slowly melt the butter, golden syrup, sugar and vanilla extract over a low heat. When it’s melted add the flour and porridge, stir it all together and mix well, then turn it into the prepared tin and spread the mixture evenly. Bake no higher than the middle shelf of the oven for 20-25 minutes, I usually wait to take them out until the very edges are going more brown than golden, because if they are undercooked there’s more of a risk that they will fall apart. Cut while still warm, and let them cool on a wire rack. Enjoy. 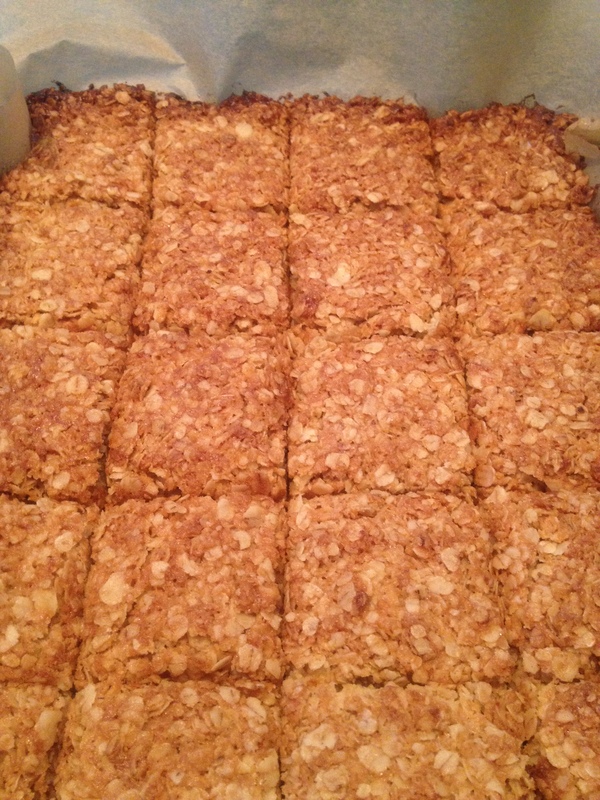 Baking, dairyfree, flapjacks, lunchbox, oats, recipe, sweet treats. Bookmark. These look delicious, I will definitely try them out! Do Laura, and let me know how they turn out. Yumm – these look and sound lovely. Always been tempted by that book! Thanks, some lovely bits in that book alright.